4-BR House-City of Winter Park - Borders Nat'l Forest! Close to the ski area, our house is located in the Town of Winter Park (not in neighboring cities with subdivision names containing Winter Park). The house is at the end of a dead-end street, where the forest begins. No neighbors on one side of us - just the Arapaho National Forest! Quiet location, far from the highway, trains and traffic. From the end of our driveway, you can begin on forest trails for hiking, cross-country skiing, snowshoeing (6 pairs for your use), and bicycling. You can take a trail beginning at our driveway and travel to the Winter Park ski resort (downhill to us from the ski resort). Otherwise, the ski shuttle comes a few doors away and will take you for FREE to the ski resort which is a ten-minute ride. You can walk to downtown Winter Park and free ice skating (we have 32 pairs of skates) in under thirteen minutes. You will be cozy at night underneath flannel sheets in each of the four bedrooms and a loft. The large master bedroom has a king-size bed (and adjoining bath with jacuzzi two person tub), one bedroom has two bunk beds with a full bed on the bottom of each, two bedrooms have queen-size beds (one of these rooms has a futon, too). Our loft has a queen-size sleeper, TV and glider chair. The living room has a sage green Lazy Boy queen-size sleeper with a built-in air mattress (comfortable!). Our kitchen was just remodeled with granite countertops, new cupboards, and new appliances. We have pots, pans, and dishes just like you have at home. There is cable TV with DVD, and plenty of board games for family and friends' fun time. If you want to be one second (literally) from the forest where you can take off on your snow shoes (we have some for you to use) or cross-country skis for a peaceful trek, and a place which is quiet from traffic and trains, contact us. Since we have allergies, our place is smoke and pet free. You will need a front wheel drive, 4WD or AWD vehicle during a winter visit. Never bring rear wheel vehicles into the Rocky Mountains in the winter time, as you must travel over a 12,000 foot pass and up some steep inclines. Beth and Terry live in Littleton, Colorado. Terry is a Colorado attorney and Beth is a Registered Nurse. We personally care for our vacation home. We often clean the home ourselves, and pay attention to cleanliness and detail that we look for when we travel. We have a good friend in the Winter Park area who helps us with cleaning. You can rest assured that we have a visitor's eye toward keeping the house in good repair so you will feel at home and tell your friends about your great experience. We thank the Lord for the beauty of Colorado and Winter Park! Quiet, yet close to the ski area. You can look out off the deck while grilling on the natural gas grill, and peer into the forest where elk, moose, deer and fox are regularly seen. You can mountain bike on hundreds of miles of interconnected trails beginning at the base of our driveway. You can also walk to the outdoor ice skate rink and sit at the fire pit while the children skate. We have 36 pairs of skates and six pairs of snow shoes for your free use. You can view into the Arapaho National Forest while grilling from the deck or sitting in patio furniture. 360 degrees of mountains. You can ski to the house from a run at the Winter Park ski area, although there is some 'polling' necessary. We would not characterize our house as a ski-in/ski-out property. But, it is an adventure! There is a code posted in the house which you can use to gain access. We have a beautiful wood burning stove with glass door. The Town of Winter Park offers a nearby large Jacuzzi, adult and child's pool, sauna - all for a daily fee. 32 pairs of ice skates (outdoor rink within walking distance), 6 pairs of snow shoes, sleds. Exactly what you expect a mountain cabin!! Four day ski trip. First let me say from the wood-burning stove to be equipped with everything you could possibly want. I even saw a turkey bag in one of the drawers. This place has everything board games very quiet last house on the left of the road. Owner of the home was polite very responsive and very professional. You could easily sleep 15 to 20 people especially if you had several children ! the home is three stories with beds and rooms everywhere ! Literally two minutes from the slopes. But I would recommend four-wheel-drive during the winter months driveway is a little steep. 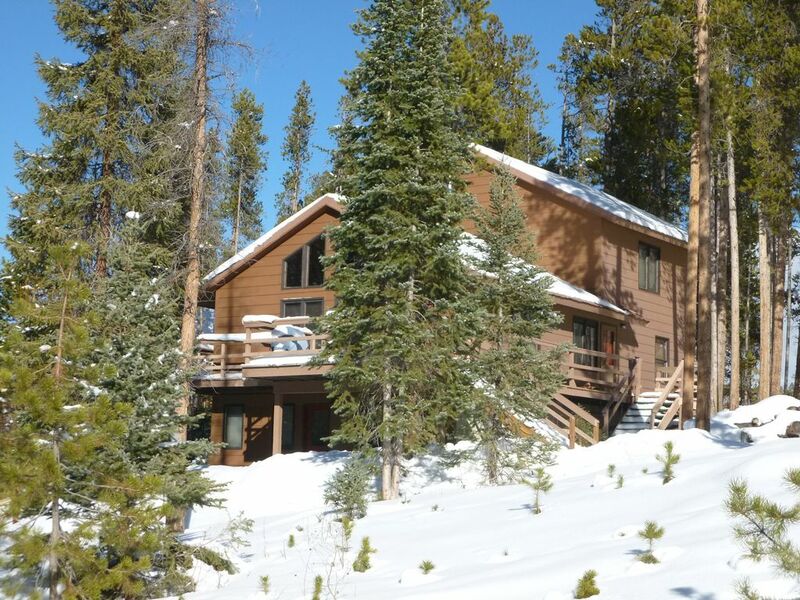 I will definitely go back to this home for my future Winter Park trips. !!! We were here for 3 nights in February 2019. There were 4 families- 8 adults and 5 kids. We had plenty of room and were very comfortable. The place is clean and well kept. The family games, ice skates, sleds, and snow shoes were a great addition. The house is close to the ski shuttle and town. The owners were very friendly and responsive. We would stay here again in a heartbeat. This house was in a great location next to a hiking trial and minutes from town. they had plenty of board games and outdoor activities for all ages. if you plan on staying at this location for skiing i would recommend this spot as it is conveniently located to the bus stop which gives you access to the ski resort and town also. the beds were comfortable and the Jacuzzi tub was a great way to relax after skiing. 10 adults and 2 children stayed in this home and thoroughly enjoyed it! The accommodations were perfect. Kitchen was well stocked, beds were great, lines and towels were plentiful. The ONLY criticism was the parking. Nothing was described about the parking until I received the email the day of arrival. Two cars park at the bottom and two at the top. 4-wheel low was required to get to the top parking spot. Snow had not been cleared for quite a while on the bottom parking, so it was very difficult for the two cars without 4-wheel drive to park there. The free shuttle to Winter Park Resort was nice. Pick up was about 5 houses down and the shuttle ran every 30 minutes. A web site is provided with exact times. Lift tickets were higher than expected - $477 for three day pass. Once we arrived, the other family was advised at the ticket window that one could purchase a season pass (about $500), which came with 10 vouchers. The vouchers allowed a "friend" to purchase a lift ticket for $80. So, before you purchase lift tickets, you might call and inquire if a season pass and vouchers would save you money. We found the nearby Safeway very busy but had everything we need. The homeowner even has a Safeway saver card in the kitchen drawer - very nice! Again, the house was wonderful and we enjoyed our stay very much!!! We really enjoyed our stay at this house. It was a perfect location for our family/extended family (4 kids under 6, 5 adults) because it's right up against the edge of the forest, so we ventured out to snowshoe and sled multiple times during the stay. It was also very accessible to the ski resort (we drove and it was about 10 minutes each way) and the Fraser tubing hill (10 minute drive). The house itself is very tastefully decorated with a winter mountain theme (snowshoes, skis on wall as decoration) and spacious with plenty of space for multiple sleeping arrangements. We would strongly recommend the owner fix the kitchen sink faucet (broken so makes it harder than ideal to clean, and also when you try to get hot water out the pressure drops to 1/6th of what it is cold) and update the kitchen floor, which has a large area where the space under the floor is exposed... both of those fixes would be relatively simple and update the overall quality of the home feel. Otherwise, the place is clean, tasteful, and very pleasant. The owner called to check in on us which was a nice touch. Reasonably priced for the area and we'd definitely come back/recommend! A delightful family get away! Our family had a wonderful time! The home is very comfortable , welcoming, and convenient. It is in a beautiful location with gorgeous views, lots of fun games, a lovely fireplace and all the touches that made us feel so at home. The owner was delightful, joy to work with and very accommodating. We will be back!